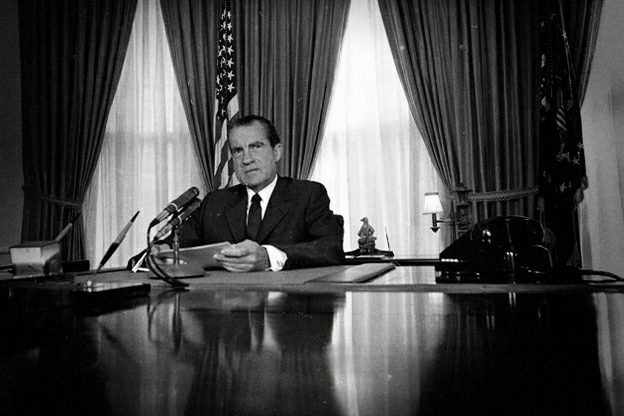 Richard Nixon in the Oval Office	(www.pinterest.com). On August 5, 1974, Richard Nixon released a tape of his conversation with his Chief of Staff, H.R. Haldeman. He released it under compulsion by a unanimous Supreme Court. It became instantly known as the Smoking Gun. Its contents were so explosive that Nixon announced he would resign three days later. The tape recorded a June 23,1972 conversation in the Oval Office where Nixon and Haldeman discussed ways to call the FBI off of the Watergate burglary investigation. They were discussing the obstruction of justice. Parenthetically, before going on, I can’t resist this little clip from the conversation. It isn’t especially relevant to the story at hand, but it’s fascinating. Nixon: But they’ve traced the money to ’em. Haldeman: Well they have, they’ve traced to a name, but they haven’t gotten to the guy yet. Nixon: Would it be somebody here? Nixon: Who the hell is Ken Dahlberg? Haldeman: He’s ah, he gave $25,000 in Minnesota and ah, the check went directly in to this, to this guy Barker [in other words, paying for the break in, which Haldeman and Nixon obviously knew about]. Nixon: Maybe he’s a …bum. Nixon: He didn’t get this from the committee [CREEP] though, from [Commerce Secretary Maurice] Stans [originally from Shakopee, I think]. Wasn’t that fun? But back to cases. If you don’t see that the Smoking Gun has some precedental value in the current Trump-Comey dust up, you aren’t paying attention. Trump also said that although Rosenstein was a “very smart guy,” he, Trump, was actually thinking about something not mentioned at all in his memo “when I decided to just do it”—that is, to fire Comey: “I said to myself, I said, you know, this Russia thing with Trump and Russia is a made-up story; it’s an excuse by the Democrats for having lost an election that they should have won.” His aides, needless to say, had spent the day saying that Comey’s firing had nothing to do with Russia. We didn’t know at the time of this interview with NBC that the president had met weeks earlier with FBI Director Comey and asked him to lay off the former National Security Adviser Flynn investigation. Director Comey memorialized the conversation in, well, a memo, that everybody wants to get their hands on now. Comey didn’t lay off the investigation; it is reported that grand jury subpoenas were issued just before Comey was fired. Trump claims the conversation never happened, but in a “he said – he said” swearing contest, who are you going to believe? The comments about the Comey firing to NBC corroborate Comey’s statement about Trump’s intentions and remarks to him. The most amazing part about this is the difference in the reaction of the Republicans. After the Smoking Gun tape was released, Republican leaders went immediately to the White House and told the president he would be impeached and removed from office. Now, they won’t even agree to form an independent commission to investigate. Update: There is a part two to this story.